Motorcycle riders are quick to share the appeal of the ride. From feeling the air against one's body to spending less time looking for parking spots, there are myriad reasons bikers become just that. One incentive that cannot be denied? The "cool" factor that comes with being able to offer a ride to a passenger. To those hesitant to hop on, motorcyclists are quick to point out that they are, in many measurable ways, safer drivers than car drivers. Indeed they enjoy a better field of vision, more maneuverability and a lower rate of distracted driving. Even more encouraging? A 2003 National Highway Safety Administration study showed that in 80% of accidents between motorcycles and cars motorcycles either were not at fault or shared less fault than the involved car. Unfortunately drivers of motorcycles suffer a disproportionately high rate of injury and death when involved in an accident than drivers of other vehicles, especially when taking in to account the fact that they are safer drivers overall. In fact, in 2013 "motorcyclists were five times more likely to be injured and 26 times more likely to be killed in a wreck than car-drivers." In light of these statistics would-be passengers may be justified in being wary of coming along for a ride. Likewise, motorcycle drivers themselves are wise to exercise caution when taking on a passenger, which puts a driver in a position of potential liability in the event of a collision. So when should you allow a passenger on your motorcycle? Here are five requirements to meet before turning the key to increase the odds that everyone will arrive at the destination safe and sound. Carrying a passenger on the back of a motorcycle changes multiple aspects of the way the vehicle operates. It can not simply be equated with operating the bike while carrying a suitcase or other heavy cargo. For this reason, wait until you have gained experience as a driver in order to better be able to handle the new way your motorcycle will feel with the new addition of a passenger. Before making the decision to carry a passenger on your bike, complete a motorcycle safety course. After successfully taking such a course, ease in to the new experience by first carrying passengers only in low-traffic areas before riding on a busy street with the precious new cargo. 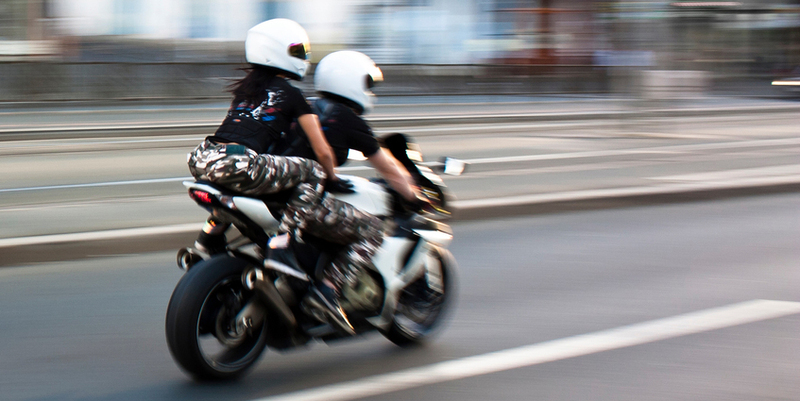 A motorcycle instruction permit typically does not permit its carrier to have passengers. While most states do allow a person with a full motorcycle license to carry passengers do check the DMV regulations for your state to be sure that you will be in compliance prior to carrying a passenger. These regulations are available in the motorcycle operator manual or by contacting the nearest DMV office. No matter how experienced the driver, some motorcycles are simply not equipped to carry any passengers. Before offering anyone a ride, check to be sure that your seat is big enough to carry two as well as that your bike has the extra foot pegs a passenger will need. Just as important? Have an extra helmet available for your passenger, one that properly fits him or her. The owner's manual for any motorcycle should provide information about the bike's weight limits as well as whether there are any suspension and/or tire pressure adjustments that you should make to the vehicle before inviting an additional person on board. In some cases your state may have additional requirements that a motorcycle must meet in order to legally carry passengers. These may include requirements for passenger footrests and/or separate passenger seating. Check to be sure that your bike meets these requirements before accepting a passenger. Carrying a passenger on your motorcycle can be a fun rewarding experience if you take the time to do all that you can to keep both of you safe. In addition to the above tips, be sure to heed any recommendations made by a traffic school or defensive driving teacher as well as by your state's DMV.